Over the past few weeks, we’ve covered quite a lot of content about "How To Photograph A Wedding", including the getting ready moments, portrait sessions and shooting both the ceremony and reception. In this episode, we are going to backtrack just a little bit and travel back into the basics, where I will share with you the one most important thing that you can take away from this podcast series to guarantee your success. First of all, a really important aspect of learning How to Photograph a Wedding is getting to know your gear inside out - not only understanding the fundamentals of photography but being comfortable shooting using your equipment in manual mode (and not trying to figure it out on the day of the wedding). If you find yourself overwhelmed with the pressure of shooting a wedding, it’s helpful to remember to just take a deep breath and go back to the basics of what you know, rather than trying to do anything out-of-the-ordinary. 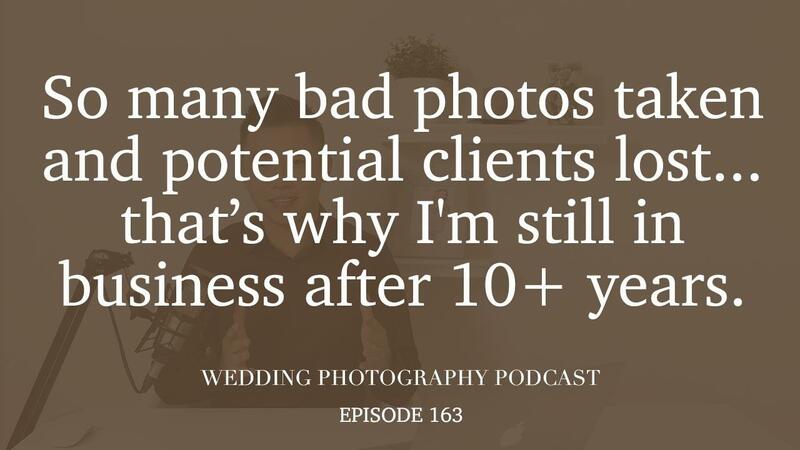 The most important aspect of running a wedding photography business applies to businesses and photographers of all levels, and that is the all necessary effort to learn from our mistakes. Whether we are talking about bad photos or losing a potential client, in order to truly grow your business and become successful, you must ask yourself what could you have done differently? Even after 11 years in the business, I still make my share of mistakes, but it is the learning process and the persistence that has taught me the most and brought the most value in the end. That being said, change doesn’t happen overnight and it’s important to not constantly be comparing yourself to other, more experienced photographers. Aim to get better one wedding at a time, and you’ll see that patience and perseverance will pay off.